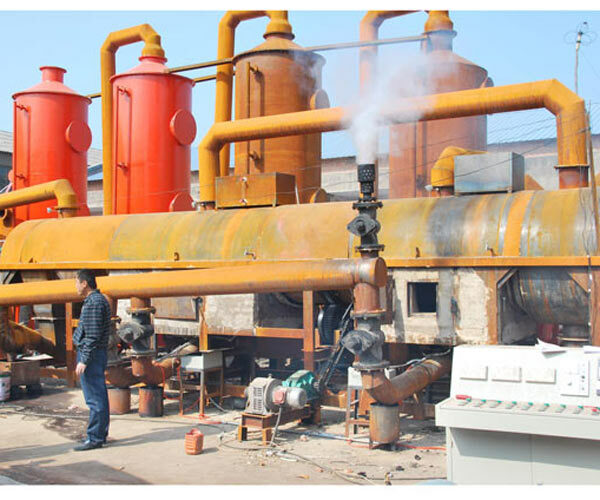 To solve the problem of household waste and ease the environmental pressure, we produce the household waste carbonization plant, which can carbonize the household waste and other biomass, such as rice husk, saw dust, palm shell, crop straw etc. Our household waste carbonizing plant mainly consists of the carbonization host, de-dusting system, cooling discharging system, spray device and other equipments. What’s more, we can equip the household waste carbonization plant with the gasifier if the customers have request. Using the gasifier can not only save the cost, but can also protect, because it does not need the fuel during the working process. Double-layer design makes the lower part of the machine contact the hot air as much as possible, so this design is helpful to raise the heat utilization efficiency from the beginning. The lower layer equipment utilize residue heat in carbonizing gas to flash steam the materials. This is the second stage to raise the utilization efficiency of heat. The optimized and concentration multi-pipe design of hot exhaust gas (generated from gasifier or hot blast heater) which includes recycling pipe, carbonizing and fission heat collecting pipe, flash steaming steam collecting pipe, and combustion emission collecting pipe can raise the heat utilization efficiency in the third time. After three time of optimized usage of heat, the temperature of the emission gas is below 100 centigrade. Under the inspection of related institutes, the heat use ratio of our equipment is over 85%. Taking the customers’ request into consideration, we have several models of this machine, they are BST-05, BST-10, BST-20, BST-30, and you can choose the one you need. The end product we can get is the biomass carbon, which has a higher carbon content, and it is free of smoke, toxic and odor, so it has a wide usage. 1. Agriculture: It can be used to improve the soil quality and heat the green house. 2. Industry: It can not only be reprocessed into active carbon, but can also be used for construction bricks with clay, what’s more, it can be applied to the generator to get the electricity. 3. Daily Life: It can be used as fuel in BBQ and other areas. Manufacture base:Beston Industrail Zone, Xiwang RD, Industry Cluster Area, Shangqiu City-476000, China. Head office:9 floor, 6 building, E-commercial port of center China, Rd. Zhengping&Lijiang, Zhengzhou City-450000, China.